Hi all, first write up so bear with me. Dashing was giving me a lot of issues with ruby dependencies and I eventually gave up. In comes Grafana. Grafana is a web-based, time-series visualization tool generally used by cloud services providers and other industries where decisions are influenced by data. I recently found a RDBMS plugin for grafana that allows us to connect to labtech and queries data. There are a few gotchas but I found that it's a little easier to setup and manage than Dashing was. One of the big catches to this is that Grafana needs time data, so feeding it a COUNT() query is not enough(except for singlestat, looks like that was fixed). The way around this though is to feed it 0 or NOW() as the first field. This one is more for testing only until they merge the changes. Once that happens I will rewrite this guide for a more prod ready environment. I am not responsible if something get borked up somewhere, standard disclaimer. This will need to run on a linux machine until the changes are merged to master, you can spin up a ubuntu or centos server for this but I am going to focus on setting up with Ubuntu 16.04 LTS. Spin up you linux distro and make sure openssh, wget, git is installed. You should now be able to browse to http://yourip:3000 and login with default admin/admin login. Now we set up the data source. 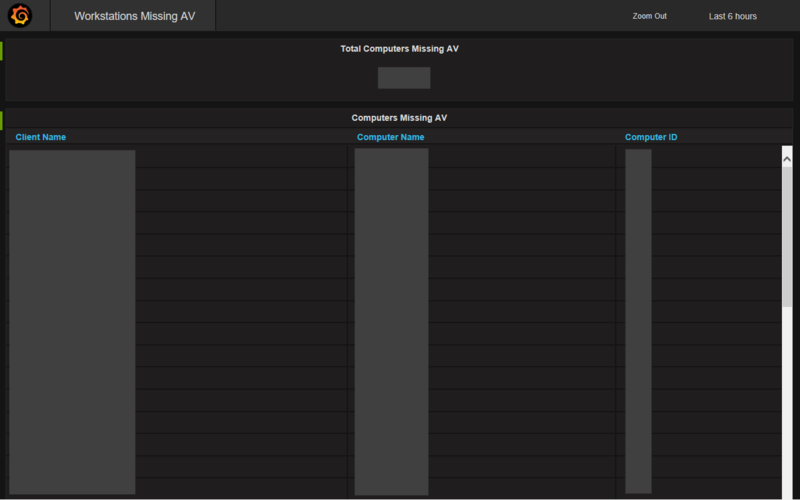 After logging in, open the dropdown in the top left corner and click Datasources and click Add Data Source. Title your datasource as Labtech, select SQLDB as the Type and fill out login data for your mySQL server. I strongly recommend creating a user that can only perform SELECT queries. Save & Test should succeed if everything is entered correctly. Create your dashboard. Most of this is up to your needs and imagination, but I'll get you started. At the top left dropdown select Dashboards>New. In the General Tab, name the panel Agent Count. In the Metrics tab, delete the fake datasource metric and add a Labtech panel data source. Under GROUP BY, remove the time($interval) field. This is only needed if your data is time series. If you click in some empty space, it should update to show you your current agent count. And that's the basic gist of it. The are some nuances here and there to find. I find the query builder requires a time field, but you can bypass it on some panels by switching edit mode and typing the query. You can also configure the thresholds and gauges and such. Have fun with it! Remember, not quite prime time ready but give it a few weeks and we should be there. This is awesome, I can see the management of this being much easier than dashing. Everything went well for me up until entering the query, I'm getting a N/A. Database connection is successful. Am I missing something? Looks like I forgot to add step. Switch back to query builder and under GROUP BY, remove the time(interval) field. You only need that if you are attaching a time field to your metric. I have one that shows me computers added in last $interval. Any handy queries/dashboards you'd like to share? 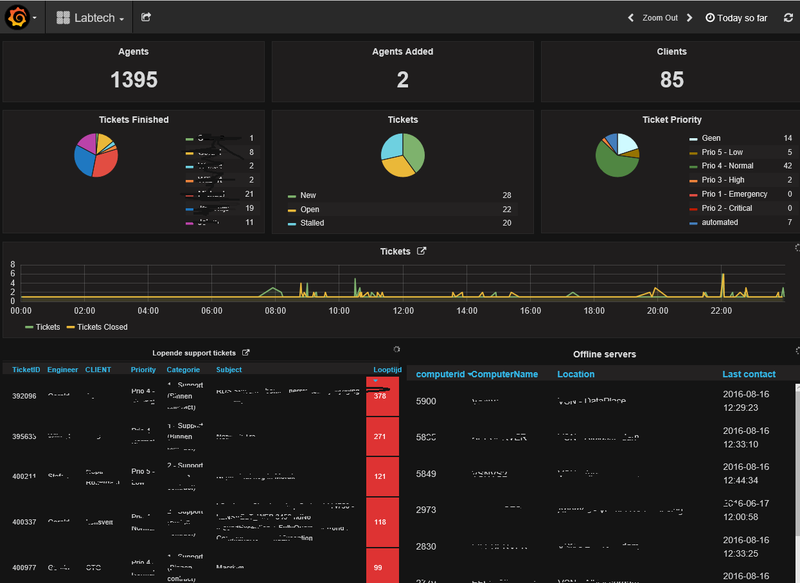 I spent yesterday afternoon setting up Grafana on CentOS and connecting it to LabTech. This thing rocks! With SQL queries in hand, it was very easy to add Single Text numbers such as Agent Count. It was also very easy to feed it a list of info and have it format it into a very nice looking Table. And to think, I was about to throw down money on BrightGauge. I was checking out the pull request on github the other day. It may be a little while before they make the merge. I'm really hoping to see what panels you all come up with. I was trying some ideas a few weeks ago, but I'm having a tough time coming up with any practical metrics that can be used by our techs for decision making. Makes for good Executive Summaries though. To use these, just create a new random panel. Exit editor and select the panel and select "Panel JSON" and paste the code in. "threshold2Color": "rgba(234, 112, 112, 0.22)"
"value": "DATE_SUB(NOW(), INTERVAL 30 MINUTE)"
I started to build a dashboard also. I'm also interested in what other people are coming up with to display. 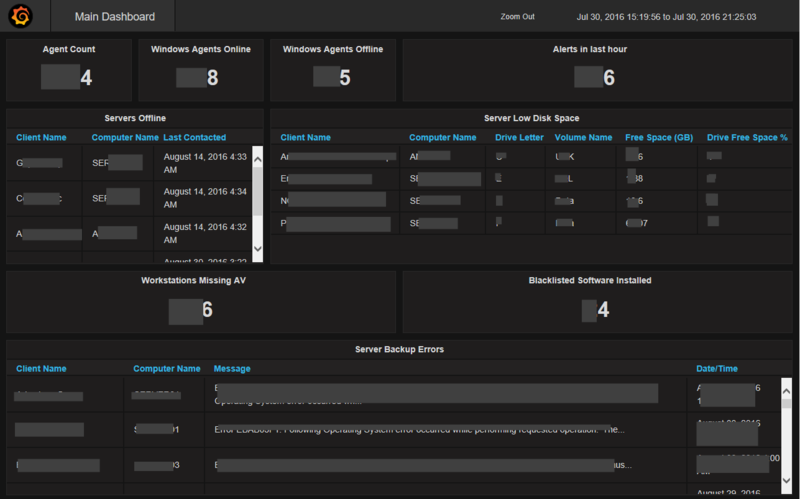 I've included a screenshot of our current dashboard. Mainly ticketing statistics, since we're using that. I'd love to see the tickets SQL. I'm by far not an expert in SQL, so how you get the proper names for status would teach me a lot. I'm trying, but my results are less than stellar. Oh, you were manually doing it. I guess that is the easy way. I was trying to be complex and create a join, which I have no idea how to do. Oh yeah, FYI, you can pull the "code" for the panels by clicking on their name and selecting the hamburger menu, then "Panel JSON", but I got what I needed, thanks. Also, I guess on the two that you scrubbed info on it might be harder to share those directly. I built this one for my technicians. If you click on the "cog" at the top and then select "Export". This will download a ".json" file that you can share with others that contains all the settings for the dashboard. This will help greatly in sharing and improving dashboards! Great tips, thanks! One of the things that prevented me from trying Grafana in the past is that I was certain it didn't support SQL sources. Docker won't "save" your changes when the image terminates, but its a good way to play around with Grafana. Where do you set the time (in seconds) to refresh the data? 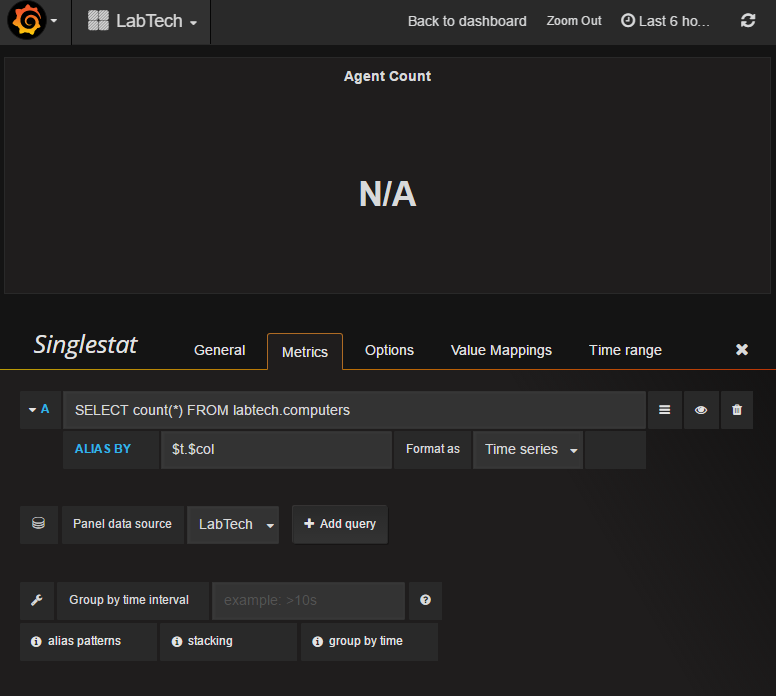 I've created as test 3 SingleStat panels (Agent Count - Alerts Count - 1mo Reboot) ... they all give me a number, but I don't know when this is updated. I need a panel with the last alerts + tickets created as text. So a list of the last alerts and tickets. When I create SingleStat panel I only see 1 line. When I create table it show me the info, but in 2 columns and I just wanted to delete I column and change column title, but I can't delete, change column. Does anyone know how to autorefresh the dashboard? It doesn't seem to do that atomatically. I've found something under Settings --> TIme Picker, but that's not it. Great product this Grafana ... not a lot of support / forums to be found unless you know one? Can anyone help me with the build of graphic dashboard. For example I want a graphic on my dashboard where I can see alerts / warnings / informational stacked up to each other. I each get a number, but it doesn't fill up the graph over time. Has not recording it or saving the current and previous information to build of the graph. How did you create that ticket graph? Here's the JSON for the ticket panel. Hopefully that will help you. I was unable to figure out how to have it start at 0. Can you create some also like for Alerts? Tried it with example you send with tickets, but I can't get it to work. they only have a creationdate. They can't get closed. and it seems that table (alerts) doesn't have any history to it. ah ok ... thnx ... What are the requirements for creating a graphic? How can I install the Piechart plugin? I was trying to create a graph for example h_clientstatsdaily --> diplaying per day Y the amount of TotalTime X minutes worked (we bill per 15min).